And are there “truly” “sugar-free” horse treats and feeds available? What is the difference between low sugar and sugar free products? Does starch make a difference? In fact, the U.S. Food and Drug Administration offers very clear guidance as to what a sugar-free claim is supposed to mean, at least for the packaged foods and drinks under its regulatory purview: less than 0.5 grams of sugar per serving, and “contains no ingredient that is a sugar or generally understood to contain sugars.” Unfortunately, there are no laws to date that regulate the terms in Equine feeds. Label requirements for Equine feeds do not require starch and sugar levels, and unless the manufacturer includes them in their guaranteed analysis, you will never know the exact percentages contained. Some folks take a very literal interpretation of “sugar” and use it to mean only the white, granulated stuff. . There’s honey, agave nectar, evaporated cane juice, corn syrup, barley malt, brown rice syrup, coconut palm sugar, fruit juice or its concentrates, maple syrup, molasses and more. And sugar by any other name is just as sweet, equally caloric gram for gram and not measurably better for you and your horse than the white stuff you know as “table sugar,” “white sugar” or “refined sugar.” So even if the exact word “sugar” does not appear on an ingredient list, that doesn’t mean a food is “sugar-free.” Plants by their very nature produce sugars for growth, so plant material does contain sugars. 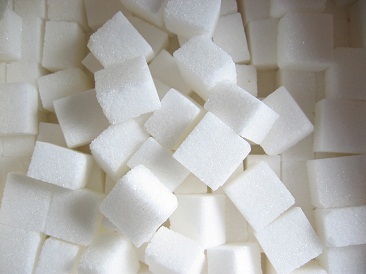 If you tune into health news, you may be hearing more about the emerging distinction between naturally-occurring sugars – like those inherent to a piece of whole fruit or a cup of milk – and those added to our foods and drinks during processing, such as the sugar used to sweeten soda, cookies, flavored yogurts and breakfast cereals. Research has focused on the deleterious health effects of high intakes of added sugar, and several health authorities have issued recommendations as to how much added sugar is appropriate. But just because a food has no added sugar, that doesn’t mean it’s sugar-free! Juice is a perfect example – and is a food category in which we most frequently encounter this particular misuse of the “sugar-free claim.” All the sugar in 100 percent juice may be naturally-occurring, but an 8-ounce cup still contains anywhere from 24 to 36 grams of it – the equivalent of six to nine teaspoons. How does this affect our Equine companions, and how do horses digest starch and sugars? insulin’s effects. This means that insulin is required in greater amounts to keep blood glucose concentrations within normal amounts, especially after a meal high in starch and/or sugar. Sugar (glucose) in the blood comes primarily from the foods ingested. The body also has the ability to make glucose in the liver, a process called gluconeogenesis. Grains like oats and corn as well as commercial grain mixtures and sweet feeds contain a high amount of sugar and starch and when ingested will increase blood glucose levels substantially more than a feed like plain beet pulp. According to a database by Equi-Analytical labs, oats and corn have an average NSC (Non-Structural Carbohydrate = total sugar and starch) level of 44% and 73%, respectively. So the problem arises of incomplete or false advertising in horse treats. Many marketing “ploy’s” would have you believe that their treats are “sugar free” when in fact they contain plant products. Some companies have even posted their ESC(simple sugar) analysis on their bags, yet claim to be no sugar. Most don’t advertise their starch content which can be well above 50-60%. These are not safe treats for horses with metabolic issues, so always read your labels!